Miniature pot-bellied pigs have all the same needs as their full-size counterparts. Your baby pot-bellied pig needs to be fed a varied and balanced diet so he can continue to grow properly once he has been weaned off his mother's milk. You need a solid understanding of your pig's nutritional needs in order to care for him properly. Your piglet should survive primarily by drinking his mother's milk for the first two months of his life. If you own both the mother and the piglets, you can start offering a small amount of pig feed pellets to your piglets in a bowl or dish. The pellets should be fed in addition to the milk they are used to. You may have to moisten the pellets by mashing them up or adding a little bit of the mother's milk to the pellets in order to entice the piglet into eating them. Your piglet will gradually begin to consume more of the pig feed pellets as he ages. You will need to wean your piglet from his mother when he is between 6 and 8 weeks old. Prior to weaning, you need to make sure your piglet is eating the solid pig food that you introduced at 3 weeks of age. If your piglet is not eating the food, you may have to spend some time teaching him to eat from the bowl. You can typically teach a hungry piglet to eat from a plate by waiting until he is hungry and then repeatedly dunking his nose in the feed until he figures out to start consuming it. If you have a piglet who has been orphaned, or if your sow is not producing enough milk to feed all her piglets, then you may have to supplement your piglets' diet with either sow milk replacer or goat milk. Your piglet should be given formula to drink until he reaches an appropriate weaning age and is eating solid food well. Piglets who are given formula should be fed four to five times a day. Piglets who are less than 4 months old should eat less than a cup of food per day, divided up into multiple feedings. Responsible pig owners and breeders avoid taking baby pigs away from their mothers too early. 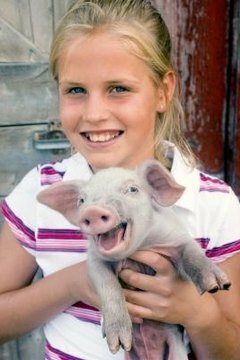 If you are receiving your new pig from a breeder, then you need to make sure the piglets are left with their mother until they have reached 6 to 8 weeks of age, when they can be safely weaned off of their mother's milk and onto regular food. Piglets who are weaned too early may not get all the nutrients and care they need from mom, which can cause long-term health and nutritional problems.